Walk up the front porch of this Acadian home on a large Â¾ acre lot on a dead end street and walk in to an open floor plan home with the living room, dining, and kitchen overlooking a wall of windows that opens up to the large back patio and fenced backyard. This home is great for entertaining with wood floors throughout the living areas and tall ceilings for an open, airy feel! The living room boasts a corner fireplace with new stone surround a new wall of built-in, lighted cabinets. The kitchen has freshly painted cabinets, a wrap around island that overlooks the breakfast room and living room. Stainless appliances, lots of storage, and a walk-in pantry with room for an additional refrigerator. Split floorplan with wood flooring in the master bedroom and an ensuite master bath. The master bath has a double vanity, separate shower, jetted corner tub, water closet, and walk in closet with built-in shelving. The additional two bedrooms on the first floor have new carpet and are separated by a hall bath. The second floor bedroom also has new carpet and could be used as a bonus room/play room or kept as a bedroom. Landry room is spacious and has overhead cabinetry for storage. The office could also be used as a fifth bedroom. Two car garage with a storage room and extra space for outdoor parking. The backyard is fully fenced. 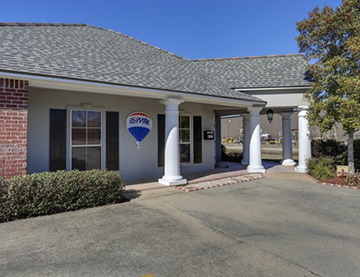 This home is conveniently located to I-12 and Florida Blvd. Schedule your showing today! Measurements not warranted by Owner/Broker/Realtor.